Good News Everyone! The Roaming Rig has been raised from the dead and is ready for action once again. So Join us live at 9pm EST on Saturday for your weekly dose of rambling games-related gibberish. While you wait, here's the latest episode. 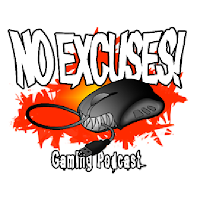 No Excuses Episode 178 - How Did This Work Again? This week: Still broke. Tech problems abound as the guys wrestle with old systems. WoW's numbers take a huge hit, again. So why are people leaving Draenor in droves? Game stores are pushing preorders harder than ever before and it's getting really annoying. Also, super cheesy sentai force, revisiting kingdoms of almalamalamalur and overly drawn out anime.